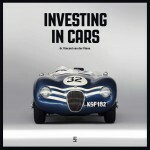 For more information on ‘Investing in cars’, please check the website (in English). Since the mid-nineties, classical cars have been increasing in value. This book shows price movements of a large number of cars. It explains why one car’s value has increased more than another’s. Based on the research on car price movements from the early eighties to the present, the book also offers predictions about what cars will attract the attention of future collectors. Additionally, it contains unique picture material of the most exceptional and most valuable cars in the world.